Appoliges for the lack of posts over the last few days, we have been away in Madrid. 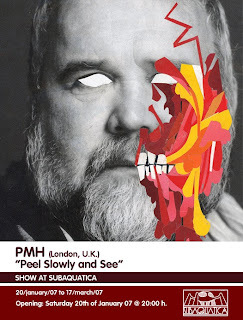 Went over to show some support for london legend PMH, who had his first solo show at Subaquatica. Better known for his restless activity curanting shows and coordinating collective projects such as “The Dilly” or “Finders Keeper” he finally found some time to get a show of his own work together. Paintings, drawings, collage and photography all made for a top show. If you are not familiar with PMH’s work check the recent Subaquatica interview here. And to view some pictures from the show head over to PMH's Le Dilly blog where he has posted some pictures. Shouts out to all those in attendence, PMH, all the London crew who flew to madrid, Sergio at Subaquatia, Aisling for showing us some top eating establishments and Nano, his girlfriend and Louis for their hospitality and an amazing home cooked lunch and all the others who made it a wicked weekend. Madrid rocks.